WEST LAFAYETTE, Ind. – Researchers have developed a design tool that enables people to create three-dimensional objects with their bare hands by using a depth-sensing camera and advanced software algorithms to interpret hand movements and gestures. "It allows people to express their ideas rapidly and quickly using hand motions alone," said Karthik Ramani, Purdue University's Donald W. Feddersen Professor of Mechanical Engineering. "We're democratizing the design process. You don't have to be an engineer or an accomplished potter to use this. You can be a kid." The tool, called Handy-Potter, represents a potentially significant advance in how people interact with computers, he said. "In our lab we have a saying, 'The mouse is dead,'" Ramani said. "With Handy-Potter, we are trying to make the computer interface natural to the user." His research team won an "all conference best paper" award for the Handy-Potter work, to be presented during the ASME 2012 International Design Engineering Technical Conferences and Computers and Information in Engineering Conference this week in Chicago. The paper was co-authored by Ramani and graduate students Vinayak, Sundar Murugappan and Cecil Piya. 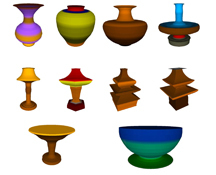 The research, funded by the National Science Foundation, addresses the limitations of conventional computer-aided design tools that are needed to create geometric shapes. "Traditional tools require the use of procedures so complicated that it is difficult to become an expert," Ramani said. "Handy-Potter is more of an imagination tool. You create the shape while you are completely focused on the idea rather than bothering yourself about the right usage of the tool. The tool learns you and does not become a barrier in creation. You don't learn the tool." Users interact with a computer using natural user interfaces like hand gestures to create and modify shapes. "For example, there are very intuitive gestures for pulling and bending a shape," Ramani said. "You learn the gestures naturally and without any user manual." The tool could have applications in areas including games, architecture, art and engineering design. It uses the Microsoft Kinect camera, which senses three-dimensional space. The camera is found in consumer electronics games that can track a person's body without using handheld electronics. "The algorithms are very intelligent," Ramani said. "They represent state-of-the-art synthesis of machine learning, geometric modeling and human-computer interaction." A patent is pending on the concept. We present the paradigm of natural and exploratory shape modeling by introducing novel 3-D interactions for creating, modifying and manipulating 3-D shapes using arms and hands. Though current design tools provide complex modeling functionality, they remain non-intuitive and require significant training since they segregate 3-D shapes into hierarchical 2-D inputs, thus binding the user to stringent procedural steps and making modifications cumbersome. In addition, the designer knows what to design when they go to CAD systems and the creative exploration in design is lost. We present a shape creation paradigm as an exploration of creative imagination and externalization of shapes, particularly in the early phases of design. We integrate the capability of humans to express 3-D shapes via hand-arm motions with traditional sweep surface representation to demonstrate rapid exploration of a rich variety of fairly complex 3-D shapes. 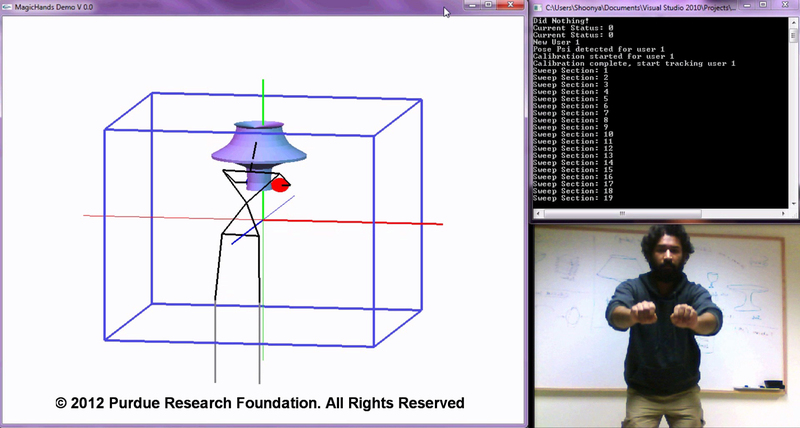 We track the skeleton of users using the depth data provided by low-cost depth sensing camera (Kinect). Our modeling tool is configurable to provide a variety of implicit constraints for shape symmetry and resolution based on the position, orientation and speed of the arms. Intuitive strategies for coarse and fine shape modifications are also proposed. We conclusively demonstrate the creation of a wide variety of product concepts and show an average modeling time of only a few seconds while retaining the intuitiveness of communicating the design intent.